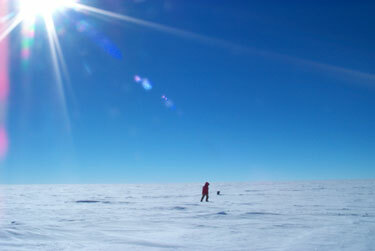 VOSTOK, ANTARCTICA-- At the coldest spot on Earth, Michael Studinger is mapping a world he cannot see. Around him stretches a snow-scape as smooth as a starched shirt, so empty of landmarks that any sense of scale or distance is lost in the white. But hidden miles beneath the icecap on which he stands is a freshwater lake as long as Lake Ontario and as deep as Lake Tahoe--its untouched waters a time capsule from more than a million years ago. For 18 days in January, the young geophysicist from the Lamont-Doherty Earth Observatory in New York and a dozen colleagues crisscrossed the ice sheet with radar and other sensors. They bounced a low-frequency signal at bedrock three times every second, neatly outlining the riddle below and setting the stage for an international effort to probe its mysterious depths. The pristine waters of Lake Vostok, as it is called, have been isolated by a continental shield of ice two miles thick for millions of years. The lake may harbor microbes unchanged from a time when Antarctica was as green as the rain forests of Brazil, offering scientists a unique test tube of life from a primordial era. The lake--discovered in 1996 after researchers combined decades' worth of seismic studies, radar surveys and satellite imaging--is "one of the last unexplored frontiers of our planet," said ecologist John Priscu at Montana State University. He is leading an effort funded by the National Science Foundation to study the microbial life of the Vostok ice. Indeed, the conditions in Lake Vostok appear so exotic that researchers at the Jet Propulsion Laboratory believe it could offer a foretaste of how life might evolve in the frozen oceans of Jupiter's moons Europa and Ganymede or in the icecaps of Mars. No one knows how this lake stays liquid in a region where the temperature recently fell to minus 132 degrees Fahrenheit, the lowest ever recorded on Earth. The temperature has not risen above freezing for millions of years. No one knows how any organism, cut off from air, sunlight or any apparent source of life-sustaining energy, could survive in its frigid currents or under such crushing pressure--more than 360 times the atmospheric pressure at sea level. If the lake does contain life, "it would not be an overstatement to say it could be one of the biological finds of the millennium," said USC Dean of Research Donal T. Manahan, a biologist who is chairman of the polar research board of the National Academy of Sciences. The opportunity to sample such an ancient, untouched habitat, Manahan said, "comes once in a million years." And whatever mysteries Lake Vostok may preserve, it embodies a troubling question at the heart of every human activity in Antarctica: How can researchers study a place so unique and delicate without destroying it? Antarctica, the last open continent, is a world of killing extremes and unexpected grace, a desert of ice where compasses lie and it is usually too cold to snow. Sun dogs--vast sparkling halos of ice crystals in the air--wheel in the sky. Penguins and seals dawdle on the sea ice. Mirages dance on the horizon. Volcanoes fume under the ice. Lake water fizzles with laughing gas. Despite herculean efforts by the U.S. National Science Foundation to minimize the impact of human activities in recent decades, people can hardly help but jeopardize the study areas that draw them here. Indeed, this is a land where biologists gingerly walk from rock to rock, lest they unintentionally trample rare soil colonies of microbes or sparse lichen. Drums of human waste routinely are shipped thousands of miles to California. No one dares touch the birds or marine mammals because, under the terms of an international treaty, they could be fined or even deported. Nevertheless, to reach remote study sites, they contaminate the purest air on Earth with exhaust fumes from fleets of motorized vehicles and aircraft. In a single season, one remote ecological study area in Antarctica's Dry Valleys logged 700 helicopter landings and takeoffs. Although NSF researchers conscientiously recycle tons of trash and waste every year, hundreds of thousands of gallons of raw sewage spew into coastal waters every day from McMurdo, the main U.S. base in Antarctica. It may be another two years before a waste water treatment plant will be built. Scientists worry too about the long-term impact of the research tools they employ, from the stream gauges that monitor meltwater flows and the radioisotopes used as tracers in Antarctica's few streams and lakes, to the remote-controlled robots that explore under the ice shelf. In the broadest sense, such concerns are central to any scientific endeavor. In physics, the problem was formulated mathematically by Walter Heisenberg as the uncertainty principle, which suggests it is impossible to separate the experimenter from the experiment. At least at the level of quantum physics, no one can measure a particle without disturbing it and altering its properties in unexpected ways. "Lake Vostok is the biological equivalent of the Heisenberg uncertainty principle," said atmospheric chemist James H. Butler. "How do you sample something without changing it?" Butler is one of a team of scientists from the National Oceanic and Atmospheric Administration camped a mile from the South Pole this year to analyze the ancient air preserved in the snow there. To avoid having their work ruined by fumes blown from the U.S. South Pole station nearby, they are conducting their research at the far edge of a special clean-air quadrant. The area is upwind of the station's busy runway, where cargo planes took off and landed 262 times last year. Rarely, however, is the scientific paradox posed by human presence framed so starkly as in the effort to explore Lake Vostok. "It is very special because it is a fossil lake, where we do not know if some biological community might have survived for a million years or more," said Mario Zucchelli, manager of the Italian Antarctic Program. In a sense, Lake Vostok is a planet in the ice, isolated by extreme depths of frost rather than by the cold vacuum of space. The robot probes being considered to explore Vostok are the same as those being designed to probe the icy interiors of Ganymede and Europa. One plan envisages the use of a bullet-shaped robot that melts its way through the icecap into the lake with instruments, cameras and perhaps even a robotic submarine on board. JPL scientists have tested a prototype of such a probe at the Monterey Bay Aquarium. But when they lower a robot probe into the lake, scientists could risk contaminating its waters with microbes from the surface or altering its chemistry with hydraulic fluids or grease from the probe itself. If they do successfully sample the lake, there is at least a remote chance that they may bring to the surface some pathogen against which humankind has no natural immunity. An international consortium of scientists has been brooding for four years over how best to proceed --or whether to proceed at all. "Here you risk having to go out and sacrifice some part of the planet in order to learn more about the planet," said University of Hawaii oceanographer David Karl, who discovered microscopic life forms in the ice above Lake Vostok. "It is an ethical dilemma. "How do you bring up a sample without contaminating the lake?" said Karl. "No one wants on their tombstone: 'I polluted Lake Vostok.' "